To fulfil one’s dream, especially if you dream big, takes time but it is encouraging and inspiring to see someone succeed, especially if you have admired what and how they do it over the years. 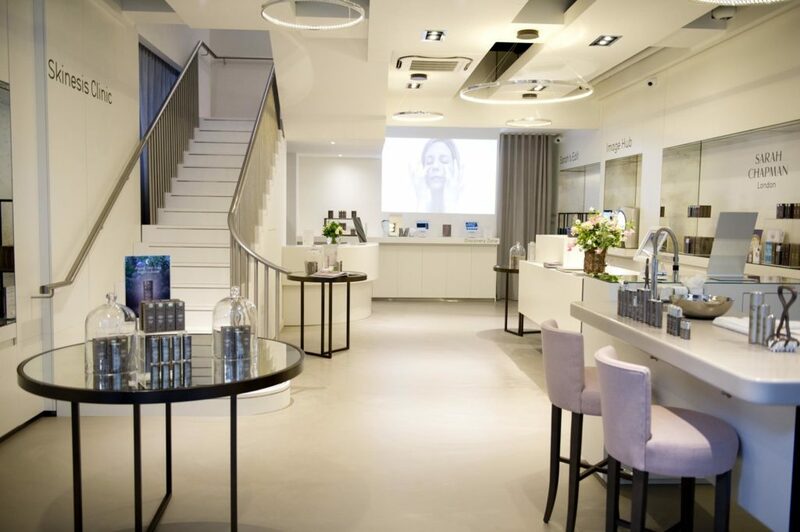 Recently I was lucky to be given a private tour of Sarah Chapman‘s global flagship store and new Skinesis clinic which opened right in the heart of Chelsea – it is a calm and heavenly oasis that takes the concept of modern beauty to a new level. Located in the quiet enclave of Pavillion Road, in place of what used to be a ground floor children’s store, now it is a 3,000sq/ft space, split between retail and consultation space on the ground floor and seven room treatment clinic upstairs. When you enter the store, all high ceilings and lots of light, you are welcomed by the smiling & chic staff ( personally I appreciate both male and female perspective on skincare & products & your other half might benefit from advice as well, if he comes with you or on his own), who will happily guide you to the area of your choosing, depending on your needs. There is a Theory Bar ( you can sit, talk, apply the products and learn the best techniques and tips ). In the future Skinesis dermal experts will host masterclass sessions on subjects like cleansing, using Sarah’s unique experience and application methods. Armed with the right skincare products and tips, you will go home where you will skilfully look after your skin, making sure it looks healthy and beautiful, irrespective of your age. There are also iPad stations, in case you come with kids or your companion, so they will be entertained while you have some ‘me-time’. The Hub focusses on the diagnostic of your skin and includes educational and tutorial space. You can also watch Sarah’s video tutorials – her massage technique is heavenly and makes your skin glow but I do wish my fingers were as effortlessly nimble as hers ! Vista machine will scan your face ( this service is complimentary ) and give you an indication of the true state of your skin, including pigmentation, spots, texture, wrinkles, pores, sun damage etc. and a consultant will be able to recommend a personalised skincare regiment based on your results. Images will be saved, so when you come back again, you will be able to compare results and choose the best skincare strategy for you in the moment in time. Fancy a pit stop for instantly glowing and radiant skin? Then Skin-Glow LED Light Pod is for you. It is positioned at the back on the store, on the left, behind the staircase and you will experience its rejuvenating qualities or treat problematic skin (each 30 minute session includes a ten minute skin consultation and cleansing, followed by a 20-minute light therapy – if you are lucky you can have a walk-in appointment but it’s not a bad idea to book it in advance ). Just across from the pod area there is an interactive ‘Discovery Zone’ with shelves displaying ‘Sarah’s Edit‘ – non-Skinesis products, like supplements or tools, that Sarah recommends. There is also a large video screen with Sarah’s YoutTube tutorials & product tips. If you are lucky, you might even see Sarah in-store, giving advice between her clients appointments. Now, to Sarah’s piece de la resistance, the Clinic. Go up the sweeping staircase and emerge, feeling like Cinderella ready for the ball, after the treatment. There are six treatment rooms upstairs, all benefitting from natural skyline light and a cutting-edge laser therapy room. If you are lucky, you might be booked in with Sarah ( she is famously discreet but her waiting list is a long one & deservedly so, as she has a wise and experienced head on her shoulders, beautiful skin, which is a true testament to her work & lifestyle and a calming demeanour ), otherwise you get a treatment with a dermal therapist trained by Sarah or skilled practitioners, if you fancy a treatment like Botox or dermal fillers. While the area downstairs is modern, welcoming and cool, upstairs you experience calmer vibes & get to treat your skin from the inside out as well, with the help of herbal teas displayed for your choosing on a beautiful Art deco trolley. I had a chance to ask Sarah about what actually makes her flagship store and Skinesis clinic different to other facialists’ salons and what was the inspiration behind it (I consider this to be one of the joyous perks of my job, as I get to talk to amazingly talented people like Sarah and get a little glimpse behind the scenes ) and she was charmingly descriptive & candid when it came to her answer. ”In terms of the clinic, what makes us different is that we don’t follow a step-by-step formula. I train all my therapists to be ‘thinking therapists’, instilling in them the importance of stopping to look, think and watch, enabling them to tailor your treatment accordingly. This bespoke approach ensures that each treatment caters for exactly what & when your skin needs needs it, for truly transformative results. We also push the boundaries in our approach, using semi-medical techniques with traditional hands and machines. From the boutique’s perspective, I wanted to mirror the work we do in treatment upstairs with an informative and hands-on approach to retail downstairs. In-store, our skincare experts can take you through a full skin diagnosis with our state of the art Visia Skin Cameras and advise you on the correct skincare approach accordingly. I wanted to be able to fully educate my clients and customers, so we designed a specialist ‘Theory Bar’ where you can enjoy a masterclass in how to use the products, an ‘Image Hub’ full of instructional video demonstrations and a ‘Discovery Zone’ complete with interactive iPads – all of which are complimentary. One of the biggest advantages in this new phase of Sarah Chapman London is the space we have, with flexibility of services that I can now offer my clients. We are now able to offer ‘drop-in’ treatments, which is something I have wanted to offer for a long time but our previous treatment rooms were always at full capacity. Now, you can stop into the Boutique and enjoy a 20 minute Dermalux LED Collagen Therapy ahead of an event or perhaps just for an extra boost, with our state of the art ‘Skinglow LED Light Pod’. Sarah collaborated with award-winning Architects and Designers Studio RHE who managed to harness her approach to skincare & reflect them through elegant designer detailing. Admiring light features, antique mirror finishes & sensuous textures you can’t help but breath out and relax even before you are lead away to your treatment room. However we often judge the space by smaller, finer details and I think only a woman can think of a little room, where one can fix make-up discretely after a treatment, before emerging triumphantly into the world from a soothing and relaxing cocoon. On that note, when are YOU planning to visit Sarah’s store & clinic?